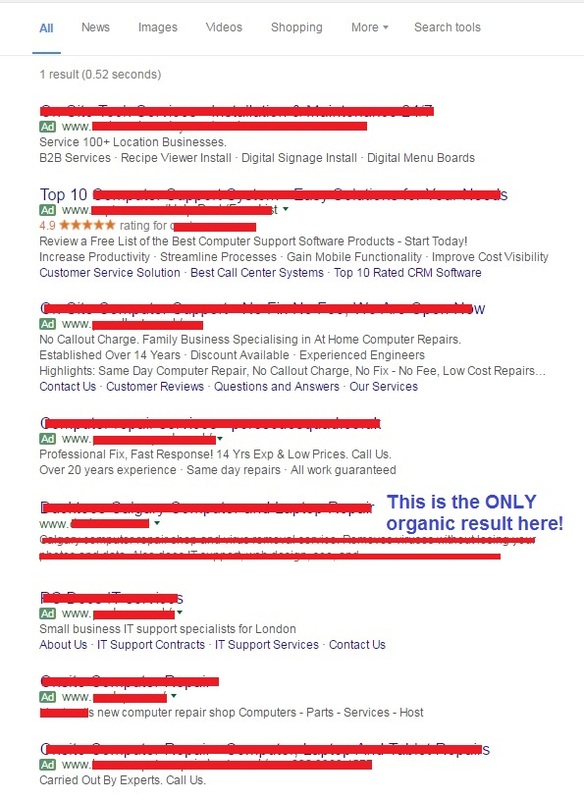 Only Seeing One Organic Listing In Google? The Rest Ads? Home > Google News > Google AdWords > Only Seeing One Organic Listing In Google; Likely A Bug. Only Seeing One Organic Listing In Google; Likely A Bug. Every now and then, I see someone complain that Google is evil because they are only showing one organic result for their query in the search results. The organic result is surrounded by four AdWords ads on top and three ads on the bottom. Whenever I try to replicate this myself, I see the many organic results. It is just weird that this would even be a bug. I mean, it happens randomly enough to folks and I see this reported to me probably every couple months. See, only one organic result in the middle, surrounded by AdWords. Again, I bet if I had the query, I would not be able to replicate this. Just a weird bug, I've seen many people report over the past couple years.